The Pi is an incredibly capable, affordable, portable, credit-card sized single board computer that is really upgradable and customisable. The Pi comes with industry standard interfaces, low power consumption and a range of inputs/outputs so you can use it with lots of things like your TV, laptop, monitor, or your router at home. 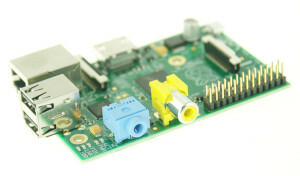 Unlike other single board computers, the Pi has GPIO interfaces, which lets you directly connect with real objects like motors, sensors, lights etc. It’s great for robotics, remote control cars and home automation. It’s awesome as a media centre for high definition TV (watch films, sport, play games, listen to music), and fantastic for weather stations. Build yourself a quad-copter, or find a way to use it in art, music or theatre projects. Of course, it’s also more than capable for firewalls, print, web, or file servers too!